The P-51 Mustang was one of the best fighter planes from World War II. 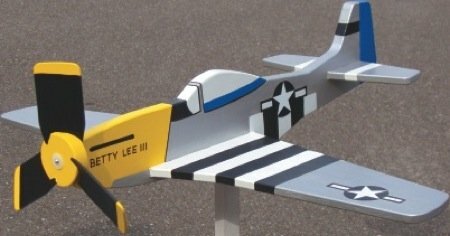 Add this P-51 whirligig to patrol your garden with these free plans. There are patterns for the nose, cockpit, and tail. The patterns include painting details to recreate the whirligig of the photo. A quick search online and a little creativity can have you designing a different paint scheme to match your interests. Click the link below to scramble your own P-51 whirligig.